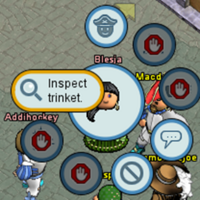 Trinkets can be seen by others, one-at-a-time, from a radial menu option. When a trinket is equipped, the radial menu has an Inspect trinket button. Trinkets are little objects to collect and display. Some may be purchased at the palace shoppe, some may be won by defeating Brigand Kings or other monsters, some are given out as rewards for special oceanwide events, and some trinkets are only available from Ocean Masters and Ringers. They are accessible in the "Trinkets" section of the booty panel and do not decay. Trinkets may be displayed in scenes using the display case furniture item, and they may be equipped one-at-a-time in the booty panel to be seen by other pirates. (Note: untradeable trinkets cannot be placed in display cases.) The list of portrait items shows which trinkets may be held in portraits. Some trinkets can only be created by Ringers, and are occasionally given out as prizes in tournaments or as rewards for other contests. Trinkets are not given out upon request. Do not ask an Ocean Master for a doll or other trinket. You will not get one. Trinkets from Brigand Kings, Sea Monster Hunts, and various expeditions can be used at a trading post, where they can be exchanged for various designs and other assorted goods. Some trinkets may be inscribed with a line of text containing no more than 100 characters. Those trinkets can only be inscribed once with the notable exception of the fruitcake. Some trinkets are auto-inscribed including those won from Brigand Kings, skellies, and zombies. Ocean Masters and Ringers can configure automated tournaments to auto-inscribe a trinket prize with the name of the tournament, the name of the winner, and/or the date on which the trinket was won. On inscribable trinkets, if there is no text present, players can add their own text (there is a 100 character limit). It is possible to change font size and color, and use bold, italicized, and underlined text. The formatting tags count towards the 100 character limit, however, leaving less room for the actual message. Also, the font size and color are quirky, so it's probably best not to use them unless you have a fruitcake trinket that you can use to test the inscription on. See the forum thread for more information. Some trinkets may be player-inscribed. Note carefully that inscriptions are permanent. The following trinkets are available currently. Only a small percentage may be purchased. The rest must be won through contests, tournaments, or other challenges. Most medals are available for purchase at the palace shoppe. They can all be inscribed. The color options are listed below each trinket. Most pins are available for purchase at the palace shoppe. They can all be inscribed. The color options are listed below each trinket. A doll is a special trinket depicting one of the Ringers or Ocean Masters. They are given out only by the Ringer/OM who is depicted. They do not give out dolls on demand. If a Ringer/OM retires, they no longer have the ability to magick up new dolls. Dolls can be inscribed, although they are almost always inscribed by the Ringer/OM before being given to a player. Dolls of Brigand Kings first appeared in March 2013, when they were released as a Monthly Rewards Program prize. In March 2013, the Admiral Finius doll was released. In April 2013, the Gretchen Goldfang doll. In May 2013, the Vargas the Mad doll. In June 2013, the Azarbad the Great doll. In July 2013, the Madam Yu Jian doll. In August 2013, the Widow Queen doll. In September 2013, the Brynhild Skullsplitter doll. In October 2013, the Barnabas the Pale doll. The ghost doll is available from Haunted Seas. For Halloween 2012, pirates had a chance of winning special "candy" trinkets from Sea Monster Hunts and Brigand King battles. These trinkets could be traded in for skelly, werewolf, and/or zombie dolls. These dolls have subsequently been made available from trading posts. For Halloween 2013, pirates had another chance of winning these same special "candy" trinkets, which could be redeemed for Frankenstein's monster, goblin, and/or vampire dolls. For Halloween 2014, pirates had a chance of winning Ghastly candy trinkets from Sea Monster Hunts and Brigand King battles. These trinkets could be traded in for witch, mummy, and lantern king dolls. For Halloween 2015, pirates had another chance to win Ghastly trinkets from Sea Monster Hunts and Brigand King battles. These trinkets could be traded in for space oddity, cat lass, and sea creature dolls, as well as the witch, mummy, and lantern king dolls from 2014. Upon defeating a Brigand King, each experienced* member aboard the ship will receive a special trinket particular to that king. These trinkets can be held in portraits. Brigand King trinkets are available in either six or seven colors, depending on the Brigand King. The color options are listed below each trinket. * On subscription oceans, a pirate must be subscribed in order to receive their trinket from a Brigand King. On doubloon oceans, a pirate must have at least a pirate badge. Trinkets can be won from Greedy brigands. Trinkets can be won from certain PvP battles on the Obsidian Ocean. Pirates that successfully voyage to Atlantis may be awarded one of several Atlantis trinkets. These trinkets may only be acquired from treasure chests collected during the voyage once the ship has divided booty in port. The color options are listed below each trinket. In September 2013, Clotho ran the Create Atlantis-themed trinkets! event which resulted with the introduction of three new trinkets to Atlantis. Pirates that successfully voyage to the Cursed Isles may be awarded one of several Cursed Isles trinkets. These trinkets may only be acquired from cursed chests collected during the voyage once the ship has divided booty in port. The color options are listed below each trinket. Pirates that successfully voyage to the Haunted Seas may be awarded one of several Haunted Seas trinkets. These trinkets may only be acquired from haunted chests collected during the voyage once the ship has divided booty in port. The color options are listed below each trinket. Pirates that successfully voyage to the Kraken may be awarded one of several Kraken trinkets. These trinkets may only be acquired from treasure chests collected during the voyage once the ship has divided booty in port. The color options are listed below each trinket. Pirates that successfully voyage to an Imperial outpost may be awarded one of several Imperial outpost trinkets. These trinkets may only be acquired by defeating the soldiers in a swordfight. The color options are listed below each trinket. Pirates that successfully defend a Governor's island from a Viking raid may be awarded one of several Viking trinkets. These trinkets may only be acquired by defeating the Vikings in a swordfight or rumble. The color options are listed below each trinket. Pirates that purchase a black box from a black market may be awarded one of several black market trinkets. The color options are listed below each trinket. These trinkets may be used (in bulk quantities, along with PoE) at a trading post to purchase a design for one of the rogue class ships. These trinkets may be used (in bulk quantities, along with PoE) at a trading post to purchase a design for one of the gold class ships. They can also be traded for a variety of unique rewards. Pirates that purchase a gold box from a bank may be awarded one of several gold box trinkets. The color options are listed below each trinket. These trinkets are available in the palace shoppe. The band, chocolate chip cookies, cookies, exotic card, gemstone ring, greeting card, pie, and scroll may all be inscribed. The color options are listed below each trinket. These trinkets are frequently awarded in automated tournaments, contests, or as rewards from chests found in trips to Atlantis, the Cursed Isles, and the Haunted Seas. The color options are listed below each trinket. These trinkets are frequently awarded in automated tournaments and contests. The color options are listed below each trinket. The ribbon, fancy ribbon, signet ring, and all the flowers may be inscribed. The skull, tuft of fur, and zombie hand always come pre-inscribed. The following trinkets are only available seasonally. Most of them may be purchased from the palace shoppe, but only during specific times of the year. Additionally, some are given as prizes in tournaments. Most of these trinkets are designed by players in contests held quarterly. The color options (if any) and cost (if purchasable) are listed below each trinket. In the early months of the year, Valentine's Day-themed trinkets are available from the palace shoppe. First available in 2006, these trinkets are not designed by players. In 2011, along with all previous trinkets becoming available, a further three new player-designed trinkets were added. In 2014, along with all previous trinkets becoming available, a further two new player-designed trinkets were added. In 2016, along with all previous trinkets becoming available, a further five new player-designed trinkets were added. In the weeks leading up to Chinese New Year, Chinese-themed trinkets are available from the palace shoppe. First available in 2011, these trinkets are designed by players. In 2012, along with all previous trinkets becoming available, a further two new player-designed trinkets were added. In 2014, along with all previous trinkets becoming available, a further one new player-designed trinket was added. In late February, a Carnival-themed trinket is available from the palace shoppe. First available in 2014, this trinket is designed by a player. During March, spring-themed trinkets are available from the palace shoppe. First available in 2010, these trinkets are designed by players. In 2011, along with all previous trinkets becoming available, a further ten new player-designed trinkets were added. In 2012, along with all previous trinkets becoming available, a further six new player-designed trinkets were added. In 2013, along with all previous trinkets becoming available, a further eleven new player-designed trinkets were added. In 2014, along with all previous trinkets becoming available, a further twelve new player-designed trinkets were added. In 2015, along with all previous trinkets becoming available, a further six new player-designed trinkets were added. In 2016, along with all previous trinkets becoming available, a further three new player-designed trinkets were added. From July to September, summer-themed trinkets are available from the palace shoppe. First available in 2010, these trinkets are designed by players. In 2011, along with all previous trinkets becoming available, a further nine new player-designed trinkets were added. In 2012, along with all previous trinkets becoming available, a further nine new player-designed trinkets were added. In 2013, along with all previous trinkets becoming available, a further nine new player-designed trinkets were added. In 2014, along with all previous trinkets becoming available, a further nine new player-designed trinkets were added. Beginning in September, autumn-themed trinkets are available from the palace shoppe. First available in 2010, these trinkets are designed by players. In 2012, along with all previous trinkets becoming available, a further eight new player-designed trinkets were added. In 2013, along with all previous trinkets becoming available, a further four new player-designed trinkets were added. In 2015, along with all previous trinkets becoming available, a further one new player-designed trinket was added. Beginning in mid-October, Halloween-themed trinkets are available from the palace shoppe. First available in 2010, these trinkets are designed by players. In 2011, along with all previous trinkets becoming available, a further six new player-designed trinkets were added. In 2012, along with all previous trinkets becoming available, a further three new player-designed trinkets were added. In 2014, along with all previous trinkets becoming available, a further five new player-designed trinkets were added. In 2015, along with all previous trinkets becoming available, a further three new player-designed trinkets were added. During Halloween of 2012, an event called Trick or Trinket was run. During the event, a new series of trinkets representing candy could be won from Brigand Kings and Sea Monster Hunt locations. In 2013, the event Trick ARRR Trinket was run. The original seven candy trinkets returned for Halloween, with the addition of the Sugar tARRRt trinket. The Sugar tARRRt was initially obtained as a gift with the purchase of a Punkin' pail. All candy trinkets were found to be winnable from unannounced puzzling competitions. These candy trinkets could subsequently be exchanged at a trading post for monster doll trinkets, which could also be held in portraits. With Release 2012-11-28, monster dolls were made available from trading posts for 50 monster trinkets each. In 2014, the Trick ARRR Trinket event was run again, but using a new set of Ghastly candy. Once again, all of the candy trinkets were found to be winnable from unannounced puzzling competitions. Additionally, some competitions had Sugar tARRRts as prizes, possibly to give players a chance at obtaining the 2013 dolls from the trading post. In 2015, Ghastly candy was again available, along with three new dolls for which the candy could be traded. In 2016, Ghastly candy was again available (with the exception of the Red LicoARRRice), though no new dolls were added. Additionally, Spooky trinkets were available, which were new in 2016. Only these Ghastly trinkets were accepted at trading posts for the new monster dolls. The dolls added in 2014 were the lantern king, mummy, and witch dolls. In 2015, the cat lass, sea creature, and space oddity dolls were added. In 2016, Spooky candy was available for the first time; it could be traded at a trading post for designs for special masks or furniture. Ghastly candy was also available, giving players another chance to acquire the monster dolls from 2014 and 2015. During the winter months, Christmas-themed trinkets are available from the palace shoppe. First available in 2006, these trinkets, which were not designed by players, were available from the palace shoppe. 1 Though most seasonal trinkets are purchasable from the palace shoppe, these trinkets are not available for purchase. Rather, they are only available through automated tournaments and other contests. Additionally, the fruitcake is unique in that it is the only trinket that can be inscribed multiple times. In 2008, Apollo held the first contest to create seasonal trinkets designed by players. Out of ten trinkets that made it past the first round of judging, six new player-designed trinkets were added to the game. In 2009, along with all the 2008 winning trinkets becoming available, a further seven new player-designed trinkets were added. In 2010, along with all previous trinkets becoming available, a further nine new player-designed trinkets were added. In 2011, along with all previous trinkets becoming available, a further seven new player-designed trinkets were added. In 2012, along with all previous trinkets becoming available, a further twelve new player-designed trinkets were added. In 2013, along with all previous trinkets becoming available, a further six new player-designed trinkets were added. In 2014, along with all previous trinkets becoming available, a further six new player-designed trinkets were added. During Christmas of 2012, an event called Some Assembly Required was run. During the event, a new series of trinkets representing candy could be won from brigands and barbarians. These trinkets could subsequently be exchanged at a trading post for new furniture items. Prior to July 2012, limited edition colors of certain existing trinkets were available through periodic promotion events. In July 2012, new trinkets were added that were not available outside of the promotions. In July 2012, banana colored trinkets were potential prizes that could be won from banana mystery boxes, available as part of the Banana Box promotion. In September 2012, chocolate colored trinkets were potential prizes that could be won from chocolate mystery boxes, available as part of the Chocolate Mystery Box Promotion. In January 2013, ice blue colored trinkets were potential prizes that could be won from ice mystery boxes, available as part of the Ice Box Promotion. In July 2012, plum colored trinkets were potential prizes that could be won from plum mystery boxes, available as part of the Plum Mystery Box Promotion. In March 2013, spring green colored trinkets were potential prizes that could be won from spring green mystery boxes, available as part of the Spring Green Promotion. In March 2015, several new spring green colored trinkets were added. In November 2012, wine colored trinkets were potential prizes that could be won from wine mystery boxes, available as part of the Wine Mystery Box Promotion. Trinkets were released before trophies. Team competitions and meetups that took place before the trophy release had trinkets as prizes instead. The following trinkets were created to award very specific groups of players and will not be awarded again. During the 2005 Halloween events, a special contest was held which awarded all participants a limited edition, non-tradeable trinket. The limb attached to each body part was colored based on the team color which was awarded the prize. In late March 2006, the Sea Battle rating was removed from the game, and players who had a certain rank or experience automatically received trinkets. These are untradable and were inscribed as follows: "Awarded to <piratename> for <rank> Ranking/Experience in Sea Battle <date>." Players were eligible to receive one of each type. For example, an Ultimate Sublime Sea Battler received both an Ultimate trinket and a Sublime trinket. The trinkets were available on the Ice Ocean in early March. During the 2006 Rumble release events, a special contest was held which awarded all participants a limited edition, non-tradeable trinket. The color of the number on each trinket was based on the team color which was awarded the prize. Around the same time as the final stages of the 2006 FIFA World Cup held in Germany, a Foot Brawl competition was held on every ocean. All those who participated were awarded a limited edition, non-tradeable trinket, depending on their team's finishing postion. The color of the football on each trinket was based on the team color which was awarded the prize. During the 2006 Halloween events, a special contest was held which awarded all participants a limited edition, non-tradeable trinket. The placement of each team was directly linked to the amount of Pieces of Eight that the team collectively amassed during the competition. During the 2006 Holiday events, a special contest was held which awarded all participants a limited edition, non-tradeable trinket. The placement of each team was determined by how well each team did in 1-on-1 challenges during the competition. Players contributing significantly to the development of a Round 1 GCPP Proposal that made it to Phase 3 (prototype stage) received a Puzzled Fish trinket. Players contributing significantly to the development of a new Round 2 GCPP Proposal that made it to Phase 6 (prototype stage) received a Puzzled Fish trinket. This page was last modified on 22 May 2018, at 04:50.